Have you heard of the Zev Yaroslavsky L.A. River Greenway Trail? Neither had I until a friend who bikes and runs regularly enthusiastically mentioned there was a newly revitalized stretch of trail following the Los Angeles River over on the San Fernando Valley side lined with California flora across its entire length. The greenway opened earlier this month, accompanied with a festive event attended by an assortment of public figures, including L.A. County Supervisor Sheila Kuehl, Congressman Brad Sherman, Colonel Kirk Gibbs of the U.S. Army Corps of Engineers, Rudy Ortega Jr. representing the Fernandeño Tataviam Band of Mission Indians, Joseph T. Edmiston of the Santa Monica Mountains Conservancy, and Zev Yaroslavsky, the Former L.A. County Supervisor whose namesake now graces the half-mile, unpaved walking trail along the L.A. River. Located in Studio City, the greenway won’t just benefit people, but also a myriad of wildlife that will surely benefit from this addition connecting previously sectioned off segments of the river trail into a “four mile continuous river walking trail loop, the longest in the San Fernando Valley”. The Zev Yaroslavsky L.A. River Greenway Trail should also prove to be an insect paradise, its length selectively planted with over 3,000 native trees, shrubs and flowers – 40 different species, including two of my Cali favorites, California walnut trees and coast live oaks – each chosen for their locally evolved beauty and ability to naturally filter water that eventually finds its way into the L.A. River via natural and urban runoff. With urban sprawl continuing, setting aside land for the purpose of establishing micro-habitats like these will help native birds, insects, mammals, amphibians, and plants eke out an existence in a city that too often chooses landscaping with invasive ornamentals over the drought-hardy and climate adapted natives. The Zev Yaroslavsky L.A. River Greenway Trail’s is admittedly short in length, but one should not consider its importance in isolation. 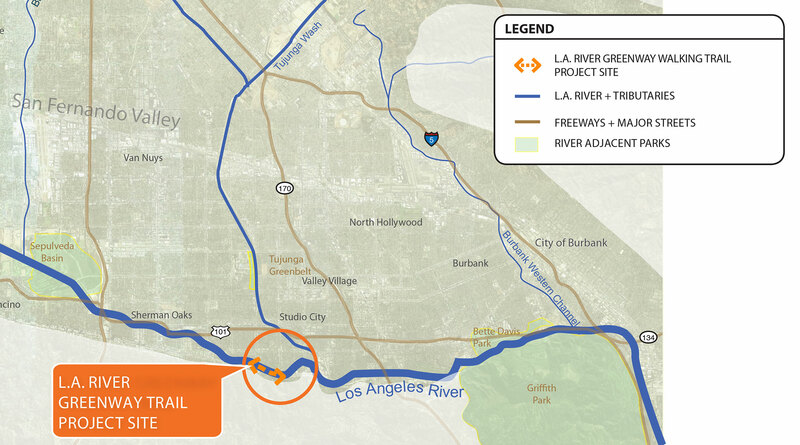 By connecting two previously existing segments of L.A. River Greenway Trail into a continuous five-mile corridor along the river, Angelenos are one step closer to a (far) future when we can travel the entire river’s length, and we can all reconnect with the diverse wild inhabitants who’ve long called the L.A. River home. As they say with a wink, “it’s not the length, but how you use it”. Last weekend, the City of Irvine officially reopened the Adventure Playground to the public. A colleague of mine whom I worked with on the playground together at my previous workplace shared this wonderful news with me. Once an unsanitary mud pit summer camp in the 1970s, the Adventure Playground has come a long way to what it is now today. The combined effort of a strong community advocacy group with the aid of a grassroots movement of residents motivated by the desire to bring natural play for their children helped revive this valuable community gem. The park is now accessible, safe, and friendlier to the environment. As designers of a highly politicized project, the design process was greeted with various challenges. There were community workshops and a lot of back and forth between stakeholders within the City of Irvine. As a strong community representative, the Defend Adventure Playground group has been at the forefront of Adventure Playground’s revival for many years, participating at the workshops, voicing valuable opinions and concerns about the redevelopment of the new playground and the importance of unstructured play, and really pushing the city to bring back the beloved public park. Also check out this local blog from Fun Orange County Parks, a site that describes and reviews the new Adventure Playground. I have not visited Adventure Playground yet, but I plan on going soon. I highly recommend you visit too! As a child growing up in the Sunset district of San Francisco, I was very lucky to live within a five-minute walk to Golden Gate Park. About once a week, when my parents had their day off from work, my dad and I would walk together to the park. Every visit to the Golden Gate Park was exciting and special. Taking in the scenery as we entered the park from the street, my father and I would walk among the the tall Cypress and Eucalyptus trees. On cold mornings, my dad would make two cups of hot cocoa and we would enjoy it sitting on a bench by one of the park’s many lakes. We would also snack on toast and I would tear off the crust to feed the pigeons; the non-crusty portions of bread were reserved for dipping into the hot cocoa. I loved feeding the pigeons and getting close to the cute little squirrels. I also remember taking field trips the California Academy of Sciences before it was renovated. My family and I would take visiting relatives to Stow Lake where we rented pedal boats for an afternoon on the water. Other favorite spots were the always beautiful Japanese Tea Garden and the Botanic Garden. 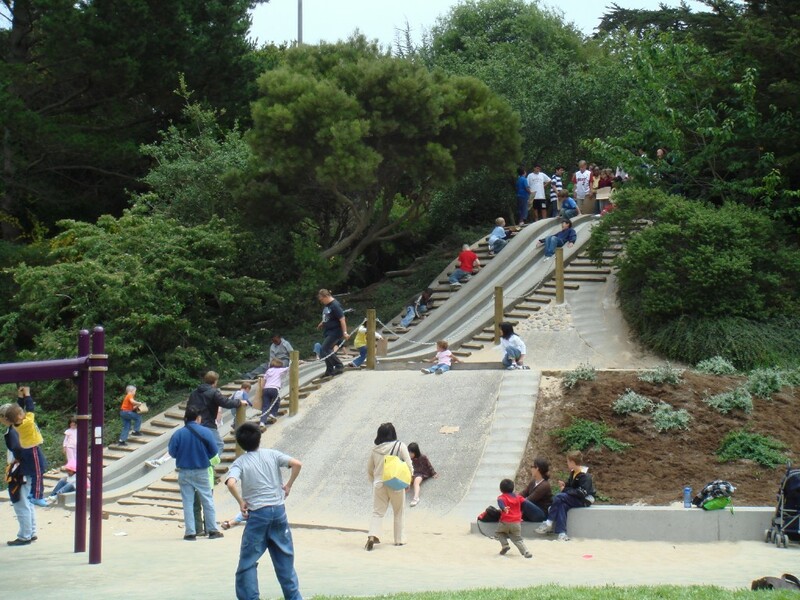 But I have to say that my all-time favorite part of Golden Gate Park as a child was Koret Children’s Quarter. In particular, I absolutely loved riding down the concrete slides on a piece of cardboard. To this day, the concrete slides are a timeless favorite of the playground and the park, which I hope will be preserved for many more years to come. Hike Up Taco Peak to the Not-So-Secret Griffith Park Teahouse: It seems all of Los Angeles is talking about the guerrilla art installation, The Griffith Park Teahouse, a structure which magically appeared seemingly overnight near Dante’s Peak in our city’s largest public park. Though it is still standing as of now, there are murmurs the hand-built structure is going to be dismantled despite the love and praises amongst city hikers who’ve made their way to visit and share photos via Instagram, Twitter, and Facebook. There’s already a petition to save it, so hopefully you’ll make it over the holiday weekend for a visit and the view. Norway Aims For World’s First “Bee Highway”: Beekeepers, biologists, civilians, designers, and politicians in Oslo are teaming up to create the world’s first “Bee Highway”– an interconnected series of flower fields and green roofs that together form a “pollination route” across the city. A New Playground in the Bronx Soaks Up the City’s Problematic Storm Water: A new Bronx playground is designed to capture between 500,000 and 700,000 gallons of storm water using a porous layer of gravel beneath the play yard’s turf field, alongside a long bioswale filled with plants designed to act as a giant sponge, soaking up storm water.